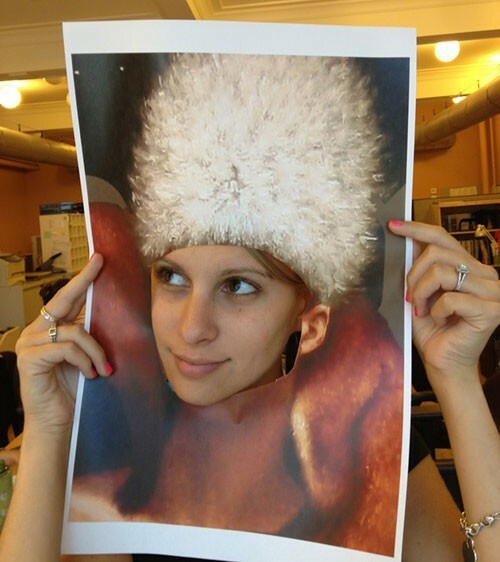 Our marketing director, Samantha Henkin, tries out a mini version of Chronogram's January 2011 cover cutout. Doesn't she look great? It's been two decades, a fifth of a century, over seven-thousand days—Chronogram is turning 20, and we want to celebrate. Take a good look at Wall Street in Kingston today, because next Saturday we'll be shutting it down for the summer's can't-be-missed block party. Though there's no end to the fun you can have on the 17th, here are our top five picks for reasons to stop by, whether it be for an hour or into the wee hours of the morning. Start practicing your aim because Chronogram Editor Brian K. Mahoney will be there waiting to meet his watery fate. Maybe you feel strongly about the magazine's policy on the Oxford comma, or you wish he had profiled your event in this month's issue—whatever your grievance (or if you're just looking for a laugh), have your hand at dunking our fearless leader. Paul Maloney of Stockade Tavern and Artistic Wellness Director Drew Andrews from the Center for Creative Education will also have shifts at the booth. Three balls costs $5, and all proceeds benefit the Kingston YMCA Farm Project. We'll have a stage set up on Wall Street for our lineup of big acts. Headliners Superhuman Happiness will bring their feel-good jazzy funk sounds to the streets along with soul/folk/proto-punk band Crystal Stilts. Local reggae group The Big Takeover, family-friendly combo Dog on Fleas, and world-music band Passero will also play sets throughout the day. In the evening, head over to BSP Lounge for some bumpin' beats at an after party with DJ Ali. With all of the music we'll have to offer, there's no excuse not to dance. If you have two left feet, Got2Lindy can help you out. The swing group is offering free demonstrations for all ages, so grab a partner and learn some basic steps. Later you can put your new-found skills to use at BSP Lounge's after-hours masquerade dance party. Make sure you stop by our DIY art tent beforehand to make your mask—we'll have feathers, glitter, and paint that will dry in time for you to hit the dance floor. It can serve as a fashionable disguise if your dance skills aren't quite up to par, and you'll also get an automatic discount to the party if you're wearing it. Grab a bite at any (or all) of the seven Hudson Valley food trucks that will be selling eats on Wall Street next Saturday. Slurp on some noodles or feast on some vegetable dumplings from Yum Yum Noodle Bar or get yourself a frank with everything on it at Pippy's Hot Dog Truck. For dessert, savor a frosty treat from Kona Ice. Adults can wash it all down with a drink from our beer and wine garden, featuring craft brew from Keegan Ales and a sangria and moonshine tasting hosted by Blue 57. Twenty years of magazines amounts to a lot of covers, and maybe you even voted for your favorite in our recent cover contest. Now you can have your own 15 seconds of fame on Chronogram's front page with our face-in-the-hole cutout station. Pose as Steven Kenny's snowy princess who appeared on the cover of our January 2011 issue in his painting Winterlude, or grab two friends and see through the eyes of illustrator Dave Horowitz's monster from our August 2012 edition.